Syrian Government Blocks Medical Aid To Conflict Zones As Part Of Military Strategy : Goats and Soda It's part of the government's strategy to control the flow of aid to conflict zones — and prevent rebel forces from receiving life-saving supplies. A U.N. convoy carrying aid enters Douma, a besieged town in eastern Ghouta, Syria in March. Amid suspected chemical attacks and shelling, medics treating nearly any injury in a conflict zone in Syria need supplies like anesthetics, IV catheters, syringes and sterile surgical gloves. These items are routinely included in humanitarian aid shipments. But in February, they were among the 3,810 medical treatments that Syrian authorities removed from aid convoys headed to Nashabiyah, a city in Ghouta, according to the U.N. Security Council. "These convoys are systematically stripped of certain types of medical supplies," says Linda Tom, a Damascus-based spokesperson for the U.N. Office for the Coordination of Humanitarian Affairs. It's part of the Syrian government's larger strategy to control the flow of aid to conflict zones. 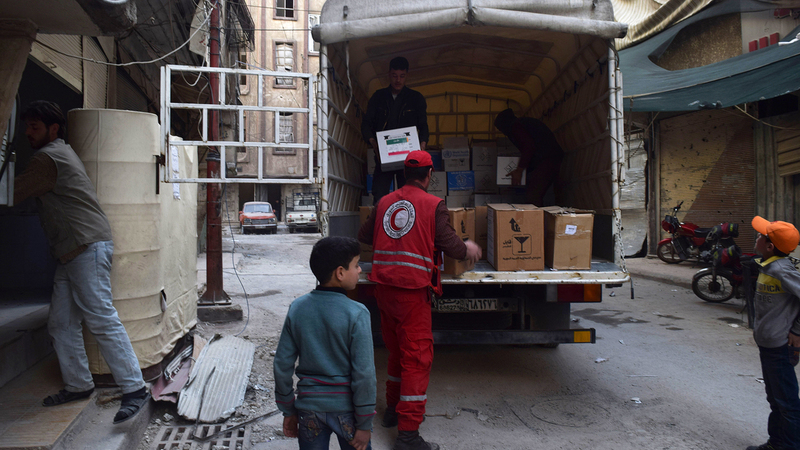 In addition to repeatedly removing essential medical items from aid trucks at checkpoints, Syrian authorities require humanitarian groups to plod through a long bureaucratic process before trucks can even depart. Shipments between areas of government control and non-government control require formal approval from the Syrian government — which means conflict zones may not receive aid for weeks or even months. Preventing rebel fighters from getting life-saving supplies is part of the government's military strategy, says Nathanael Chouraqui, a lead Middle East researcher at Iguacu, a nonprofit that studies humanitarian crises and charities. So manipulating aid shipments is a tool, he says. "They want to control what, so to speak, the enemy gets." Aid deliveries aren't intended to be politicized. They're meant to help anyone who needs assistance, Tom says. Her group coordinates shipments from U.N. convoys, which bring together items from agencies like the World Health Organization and the World Food Programme. As a result of the Syrian government's administrative process, scores of aid, like basic medical supplies, food and clothing, are seized by authorities or sitting unused in U.N. warehouses in Syria and neighboring countries like Jordan and Turkey, says Tom. That's not to say that aid isn't being delivered. Aid convoys that don't cross conflict lines have been able to continue. Deliveries from the World Food Programme reached 2 million people in February, for example. It's more challenging to drive trucks of aid to conflict zones. The U.N. estimates that 2 million people are still trapped in hard-to-reach areas, like Douma, the city that sustained an alleged chemical attack over the weekend. To travel into these places within Syria, the U.N. and its partners must specify exactly where trucks will go and what supplies will arrive far ahead of their departures. "These convoys [heading to besieged areas], they're planned weeks in advance," Tom says. UNOCHA, for example, is currently planning the shipments it will propose to Syrian authorities for May and June. Initial government permissions are only the first step. "After that, there's close to a dozen steps that follow," Tom says. The U.N. coordinates with the Syrian government and the Syrian Arab Red Crescent, a relief group, to finalize routes and loading lists specifying hundreds of items. From his work with humanitarian organizations in Syria and surrounding countries, Chouraqui says that the process often involves negotiation over details like which healthcare supplies are shipped. The priority for the government is strategy, not civilians' welfare, he says. "What is discussed at these negotiating tables is rarely for the good of the people and the severity of their needs." Even with government approval, Tom says, healthcare items like insulin and surgical kits are especially at risk of being seized or denied transport. That was the case on March 5, when 46 trucks ferried food for thousands of people into eastern Ghouta. The Syrian government removed the majority of medical supplies before permitting trucks to travel. The World Health Organization was allowed to retain these medical supplies for use later. Tom says there's usually not an apparent justification for halting these items' transport. Chouraqui says that in other cases, "when militias remove those [medical] supplies they tend to use them for themselves." Shortages of supplies make it harder for medics to treat patients, especially in besieged areas. "We are depending on the convoys, and the pressure of the international community [for medical supplies]," says Dr. Rami Al Rayes, who directs Alameen, a nonprofit that works to provide health care and education in Syria, based in Gaziantep, Turkey. Al Rayes points out that doctors in areas under attack need medical items for trauma injuries, like saline solution, anesthesia and antibiotics. In many cases, lack of supplies, facilities and doctors means that evacuating a patient to a better-supplied hospital in another city is the best option, he says. But that transport depends on government approval, too. Without access to aid, doctors are forced to make do with what's available, says James Denselow, head of conflict and humanitarian policy advocacy at Save the Children. That might mean using equipment designed for children on adults, or reusing disposable items, Denselow says. Save the Children partners reported that medics have reused bandages and needles in times of short supply. Despite the complexity of accessing these areas and providing enough supplies, UNOCHA continues trying to transport aid to as many people as possible throughout Syria, including more remote places like rural Damascus, Homs and Deir ez-Zor, Tom says. "Every time we're requesting [access from the Syrian government] to reach hard-to-reach areas," she says, "we put all the areas on the request."